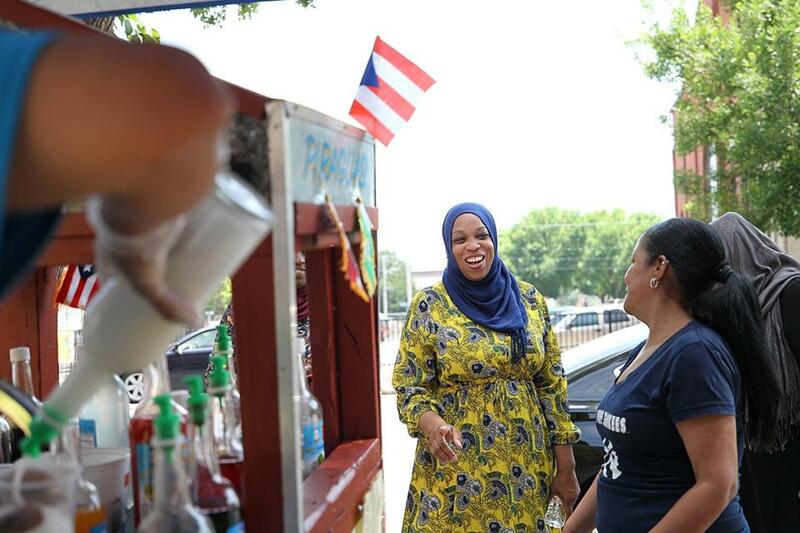 Tahirah Amatul-Wadud greeted voters on Main Street in Holyoke on July 3. A lawyer and mother of seven from Springfield, she lags far behind Representative Richard Neal in name recognition in the First Congressional District, a patchwork quilt of cities, suburbs, and hill towns that is 86 percent white and has never elected a woman to Congress. HOLYOKE — Tahirah Amatul-Wadud, a candidate for Congress, is difficult to miss on the cracked sidewalks of Main Street on a 96-degree day. A blue hijab is wrapped around her head and a yellow abaya falls to her feet as she pops into a cluster of small shops in a heavily Puerto Rican neighborhood. “I’m struggling here,” says Carmelo Hernandez, whose furniture and bedding business had been empty until Amatul-Wadud walked through the door. A lawyer and mother of seven from Springfield, she lags far behind Neal in name recognition in the First Congressional District, a patchwork quilt of cities, suburbs, and hill towns that is 86 percent white and has never elected a woman to Congress. She also has little money to make up the name gap. At the end of the first quarter, Amatul-Wadud reported just $22,000 in her campaign coffers, according to the Federal Election Commission. Neal can draw from $3.2 million. But at a time of heightened political turmoil, Amatul-Wadud’s bare-bones campaign in the First District Democratic primary in September recently received a thunderbolt of energy. The stunning June 26 victory by a political newcomer over a longtime New York City congressman has given Amatul-Wadud new hope that the improbable might be possible. In that Democratic primary, Alexandria Ocasio-Cortez, a 28-year-old Hispanic woman, defeated 10-term incumbent Representative Joseph Crowley, the party’s kingmaker in Queens and fourth-ranking Democrat in the House. Like Ocasio-Cortez, Amatul-Wadud is running on an unabashedly progressive agenda: universal, single-payer health care; a higher minimum wage; expanded high-speed Internet in a district with spotty access; increased infrastructure spending; debt-free education at public universities and colleges; and greater support for affordable housing. Amatul-Wadud, 44, is an activist lawyer whose practice focuses on domestic relations and civil rights. She spent her early years in Brooklyn, N.Y., soon moved to Springfield, and received a law degree at Western New England School of Law. Amatul-Wadud serves on the state Commission on the Status of Women and has worked as legal counsel for religious congregations in Massachusetts and New York. 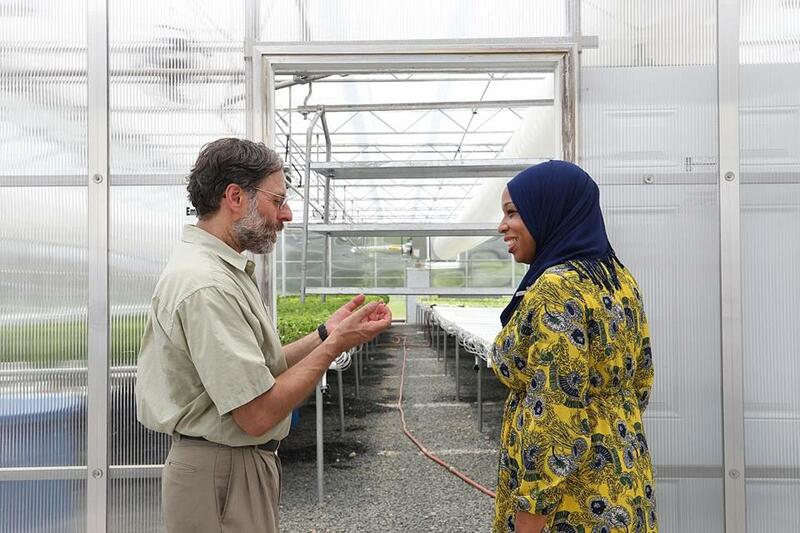 Tahirah Amatul-Wadud spoke with Fred Rose, founder of Wellspring Harvest Greenhouse. The impetus for her unlikely campaign came from several sources, she said, including her concerns about President Trump and her father’s struggles to meet his medical bills. Since Ocasio-Cortez’s upset victory, she added, donations to her campaign have picked up. More than 250 volunteers are spreading her message across a district that ranks last in the state in median income. It’s also a district that is tuning out politically, she argued, from poor neighborhoods in Springfield and Holyoke to the hill towns of the Berkshires. “Too many people in our community feel like they haven’t been heard and that our congressman has not been attentive,” Amatul-Wadud said. As evidence, she cited a large number of blank votes in recent First District elections in which Neal ran unopposed. In 2014, for example, the choice for Congress was left blank by 55,965 voters, almost 25 percent of the total who cast ballots in other races. In 2012, a presidential election year, the numbers were 70,422 blanks, or 20.9 percent of the total. “The community has been generally apathetic because life is just hard and people check out,” Amatul-Wadud said. She is trying to persuade people to check back in. There’s the “piraguas” vendor dispensing Puerto Rican shaved ice on a Holyoke sidewalk. The owner of La Pescaderia, a fish restaurant. Patrons at a beauty salon. And heat-weary residents sitting outside housing for the elderly. Her guide is Nelson Roman, a Holyoke city councilor who once lived homeless in a tent beside the highway here. He has endorsed Amatul-Wadud, joining activist groups such as Progressive Democrats of America, Indivisible National, and Franklin County Continuing the Political Revolution. Neal disputed her argument that he has lost touch with his constituents. In an interview, the former Springfield mayor said he has a long, proven track record of bringing federal help to Western Massachusetts. “I have delivered hundreds of millions of dollars to the district and paid great attention to the concerns of the people,” said Neal, who returns home regularly. That visibility is one of Neal’s strengths, said Anthony Cignoli, a Springfield-based political consultant. Neal’s financial advantage will show up in mailings and efforts to identify voters and get them to the polls the day after Labor Day, Cignoli said. He projected that a majority of primary voters will be 55 and older and as much as 65 percent will be women. Those demographics seem to favor name recognition, and the name that most people know is Neal’s. Yet Amatul-Wadud insisted that her appeal extends beyond the left wing of the Democratic Party and that her message is resonating across a district that she said needs a broad, economic boost. “If the status quo is working for you, fine,” she said with a smile. She also said her race and religion have not been a barrier to attracting support, even in an overwhelmingly white and Christian district at a time when intolerance is rising in other parts of the country. Still, “there has been a small pocket of people — troublemakers — who like to stir up Islamophobia and rumors, and it’s a distraction,” she said. That distraction hasn't kept her from pursuing a high-energy brand of retail politicking. Despite temperatures in the mid-90s, the candidate’s day took her from a greenhouse co-op in the Indian Orchard neighborhood of Springfield, to a radio show in Pittsfield, to a holiday celebration in South Hadley on the eve of the Fourth of July. If Amatul-Wadud was sweating, she didn’t show it. “If I’m this determined without a paycheck coming in, imagine what I’d do with a staff?” she said with a laugh.